Trainees are given the basics of English that is used in their daily life like how to greet, how to deliver an opinion, etc. They are conditioned as if in a conversation class. The aim of this meeting is to prepare them to actively use English if they are in ESo’s community and also to make them ready to follow the next stages of tutorial. Trainer : Madlias, Satria, Kristian, Erlan, Eka, Balqis, Intan, Dimas. Trainees are given the basic rules of how to play scrabble well, including the strategy to get high score and to beat their opponent. It is also aimed to train them to be ready to compete in a scrabble competition done by some English clubs around campus. Trainer : Robby, Indah, Syauqi Wafa, Balqis, Arif, Nurkodri, Yudi, Dimas. Trainees are asked to tell a story, whatever….it can be fairy tales, folk tales, jokes, etc. The training is focused on how the trainees can express and bring the story as if the story is in their real world. It is intended to prepare them mentally to follow some English competitions and to be brave speaking in front of mass. Ask them to prepare (including the property) and to learn the story one week before, then at the day of the meeting, you can just give them the strategy and ask them to practice with the story they have prepared before. It is very easy, isn’t it? Trainer : Balqis, Madlias, Hikmah, Intan, Satria. Give your trainees something about what speech is, what should be prepared in speech, how to make draft of speech, and how to deliver the speech well. We have prepared some module that you can use it later. In this Speech 1, the exercise that you have to do is to give them some themes, then ask them to present their ideas about the theme in front (2minutes or more, it’s up to you). Give them some constructive criticisms and then ask them to prepare a longer speech using the same theme at home (10 minutes). Ask them to prepare or to look for many matters or supporting information from all around the world about their speech that will be presented again in Speech 2. Perhaps you can call this speech 1 as presenting idea but just do your best and try to do this nice instruction. Trainer : Madlias, Satria, Intan, Hikmah, Balqis, Masduki. This tutorial will be given only for those who have 5 weeks in November. So, this is basically only enrichment for them. What should be given to the members is the strategy to do if they want to be successful both academically and non-academically. Trainer : Madlias, Kristian, Intan, Hikmah. Trainees are given the morphological concept of the arrangement of a word. The activities can be in form of spelling bee drilling, paper based task, and newspaper search. The department in charge will inform you and prepare the materials needed for the activity one week before hand. Trainer : Indah, Madlias, Satria, Balqis, Eka, Erlan, Dimas. Trainees are hoped to be able to have ability in presenting news. 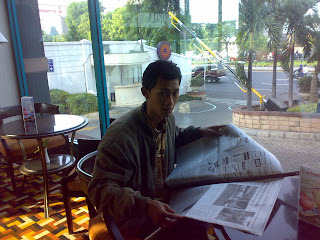 One week before meeting, ask them to cut an article in The Jakarta Post, then to practice it at home. At the day of the meeting, give them the theory of how we should present it in front well. If possible, show them a video. Give them chance to practice using their own materials. Comment what they have done and give constructive criticism one by one. Deliver some other cut articles that you have prepared before, deliver to them and ask them to present the news once more. Trainer : Resika, Balqis, Madlias, Hikmah, Intan. What you have to do at this meeting is to explain your trainees about the basics of debating. Explain them what debate is, why debate, and how to debate (general rules and guidelines to debating, speaking order in a debate, structure of a speech, roles in a debate, and points of information). If it’s possible, you may use a video, so that it will ease you to teach them how to debate. Focus on Asian Parliamentary. After explaining, try to simulate what you have given to them. Prepare a motion and ask them to debate. Trainer : Madlias, Masduki, Intan, Hikmah, Satria. This is the same as how to be a good student’s tutorial which an additional meeting. However, it is focused on the movie that is going to be watched. Trainees are asked to watch a movie and then by the end of the movie they are hoped can make a conclusion and retell the inspiring story given. Trainer : Kristian, Indah, Balqis. This is the continuation of Debate 1. What you have to do at this meeting is to explain your trainees about basics of debating. Explain them what debate is, why debate, and how to debate (general rules and guidelines to debating, speaking order in a debate, structure of a speech, roles in a debate, and points of information). If it’s possible, you may use a video, so that it will ease you to teach them how to debate. Focus on British Parliamentary. After explaining, try to simulate what you have given to them. Prepare a motion and ask them to debate. This is one of the sequences of TOEFL training conducted in this tutorial program. Firstly, give the trainees structure test usually met in TOEFL test. Let them do it and then discuss it together. Try to apply problem solving techniques. Trainer : Madlias, Kristian, Satria, Dimas,Erlan. Trainees are asked to analyze an essay and judge the essay. Let them think the structure, the content, and also the way to make an essay interesting by looking at the essay they have. Give feedback and also the theory of how to make a good essay. Then, let them make an essay in a very limited time but still has to be good. Give them homework to prepare an essay for paper presentation. Trainer : Balqis, Satria, Intan, Madlias, Hikmah, Kristian. The trainees will be asked to watch the trainer’s performance in presenting a paper. Then, they are asked to mention what to prepare and what aspects that should be carefully considered when they deliver their presentation. Give feedback and ask them to make a presentation. Trainer : Balqis, Satria, Intan, Madlias, Hikmah. This tutorial will be given only for those who have 5 weeks in January. So, this is basically only enrichment for them. What should be given to the members is the history of ESo, the concept of management in general, and everything related to organization. Trainer : Madlias, Intan, Hikmah, Masduki, Balqis. This is one of the sequences of TOEFL training conducted in this tutorial program. Firstly, give the trainees listening test usually met in TOEFL test. Let them do it and then discuss it together. Try to apply problem solving techniques and tell them some strategies that may be applied. Trainer : Madlias, Satria, Dimas, Erlan. This program will enrich the trainees in the theory of translation and interpreting both Indonesia to English and English to Indonesia. They are going to be drilled in translating 2 documents (English and Indonesia) and be given a feedback from the trainer after the strategy is given. Therefore, they are also going to practice how to be an interpreter in a very simple simulation. Trainer : Dimas, Satria, Madlias, Syauqi, Yudi, Nurkodri. What should be given to the members is the history of ESo, the concept of leader in general, the way to organize an event, the way to prepare a proposal, etc. This is one of the sequences of TOEFL training conducted in this tutorial program. Firstly, give the trainees reading test usually met in TOEFL test. Let them do it and then discuss it together. Try to apply problem solving techniques and tell them some strategies that may be applied. Give them another test. This is as the closing of all tutorials given to the trainees. The competition will cover all the theories given. Each PIC will compete to win their group. There will be the announcement of outstanding trainee, outstanding trainer, outstanding PIC and also outstanding board of ESo.